IRLP allows hams to talk through their local repeaters to other local or international hams using their repeaters through the Internet connecting via simple DTMF tones. For example, to link to Las Vegas, just key up our VK2ROT 70cm Repeater and send DTMF tones representing that node’s number, 3210. This allows two-way voice communication to Las Vegas but of course, you will need to call CQ to see if anyone is around! To disconnect, just key DTMF 73. General information can be obtained from the official IRLP site. Echolink enables hams to contact each other through the internet and via repeaters. The facility is available on our VK2ROT 70cm Repeater. It operates in a similar way to IRLP except for node numbers, when calling through our repeater, must be preceded with * ( a star) while the use of DTMF 73 will disconnect both Echolink or IRLP services. For those wishing to call us, our Echolink node is 725953. General information and the node status can be obtained from the Echolink site. If you are planning a visit to Sydney, give us a call on IRLP or Echolink. Besides the P25 Services also available on VK2ROT at Paddington. Waverley Amateur Radio Society is working with other groups to expand the Digital Radio Services available for testing by the Amateur Community. The Sydney CBD based facility is generally restricted to 70 cm services for Amateur Radio, however it has a significant footprint and some services are linked to additional repeaters in Western Sydney. The stack includes FM, P25, DMR, DStar and C4FM. 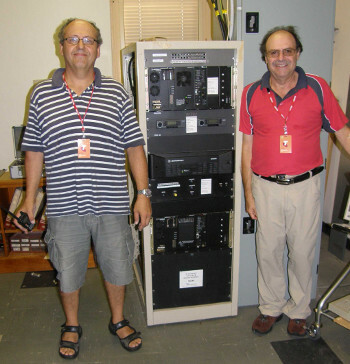 The club operates a 70cm ICOM D-Star repeater, VK2RBV, from a building in Sydney CBD operating on 438.775 MHz with a -5.0MHz offset. The repeater has full access to REF, XRF and DCS reflectors and is DPRS-enabled. It covers most of the Sydney basin. 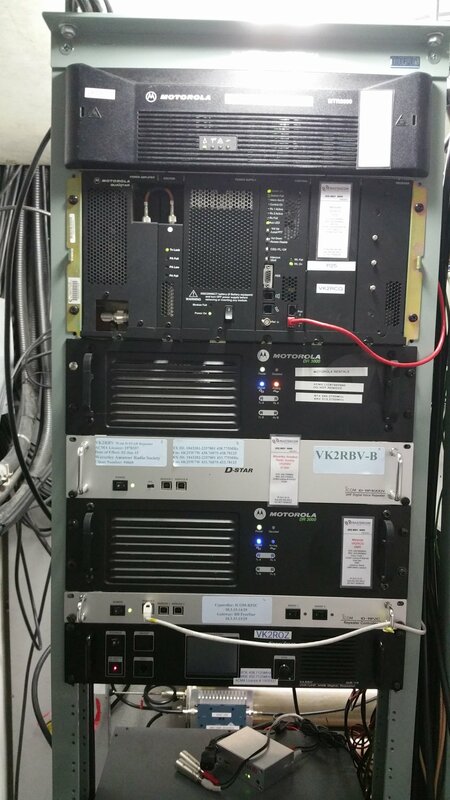 The club has installed a 70cm Yaesu C4FM repeater, VK2RBV, this unit is currently co-located with the D-Star in Sydney CBD on 438.1125 MHz with a -5.4MHz offset. The repeater is configured as AUTO-AUTO, in Yaesu speak this means that an FM signal will be repeated as FM and a digital signal will be repeated as digital. It also covers most of the Sydney basin. There is also a Wires-X node listening to the repeater Node: VK2RBV-RPT it is usually connected to its own room VK2RBV-ROOM and is available for connections.